Picture this: In the midst of furiously swiping right at a pace comparable to the rounds-per-minute emission of an M240 machine gun, your Bumble app halts. Exuberant possibilities flood your mind as you inspect your possible suitor’s profile. Good looking? Absolutely. Responsible professional? Appears to be a job recruiter, so, yes. Lives nearby? Has reliable transportation? Decent sense of humor? Check, check and check. Suddenly, a push notification surfaces on your phone’s home screen — your new match has messaged you. “Wow, that was fast!” you think, beginning to blush as your previous exuberance ascends to a full-blown 20-foot oceanic wave of positivity you expertly ride with the skill of legendary surfer Laird Hamilton. And then, with the snap of a finger, everything crumbles. Your match is someone entirely different than you imagined. This was the experience for at least one unlucky Bumble user who screenshot the below exchange before it found its way onto the popular site Reddit. 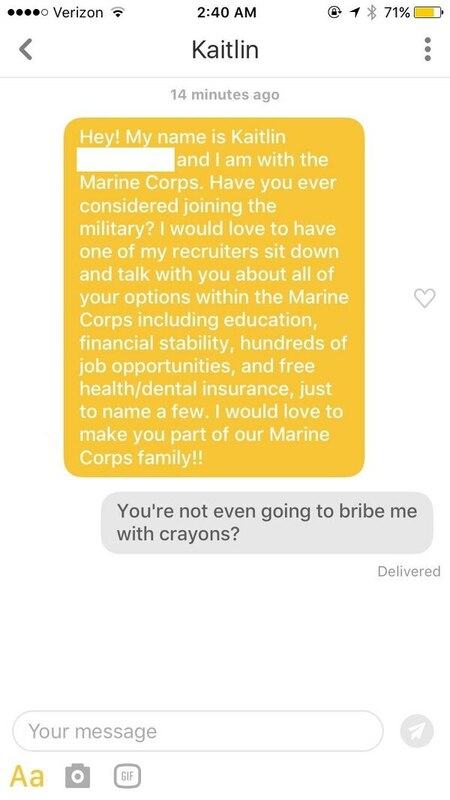 And while there are plenty of jokes to go around — like applauding his expert crayon response — witnessing such an exchange prompts one to ask: Is the military actually resorting to using dating apps to meet recruiting quotas? It’s hard to dispute the sales pitch above as manifesting from anyone except an authentic Marine recruiter. “Why?” you ask. Because no other person from any other profession would dare sell someone on the lie of financial stability after enlisting in the Marine Corps. Whether or not recruiters populating your area plan on wining and dining you before getting you to raise your right hand remains to be seen, but be on your guard — they are coming for you.